Angelica is a Patriot heiress, stalked by a brutal, fortune-hunting British officer. She is forced to trust Jack, the mystery man who pledges to take her on a dangerous war-time journey up river to her Albany home, she expects to encounter brigands, Tories and Indians. What she doesn’t expect is to lose her heart along the way. Readers will be transported to a time of peril, divided loyalties and intrigue as Angelica triumphs over threats and danger. …deftly written and well researched, concealed under a layer of romantic frosting.. In "Genesee" and now "Angel's Flight," Juliet Waldron breathes life into the turbulent times that defined the American Revolution. Set on and along the Hudson River, the story of New Amsterdam heiress and ardent patriot Angelica TenBroeck's escape from British-occupied New York to her home near Kingston combines all the elements of a vintage picaresque adventure with those of a "sweet" romance and first rate historical fiction. Angel is a true heroine. At first a damsel in distress, she shows her nature as a woman of uncommon common sense, beauty, brains, courage and resourcefulness. When she is kidnapped by the slimy Major Armistead, who lusts for Angelica, handsome, mysterious Jack comes to her rescue. Despite his Tory leanings, Angel is forced to place her trust in the enigmatic, dashing ex-soldier, as they journey through a series of increasingly dangerous situations. This is not the War for Independence from high school history books. Rather it is a gritty, volatile view of the conflict with all the lawlessness of the Wild West and the wrenching tragedy of the Civil War pitting families against each other and neighbor versus neighbor. Even the minor characters are painted with sharp strokes, incorporating humor and pathos into the mixture. 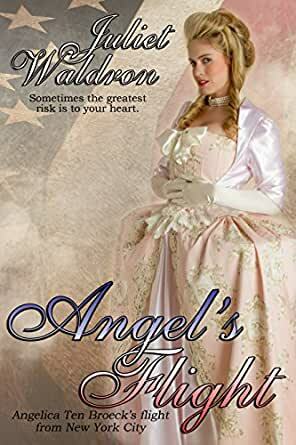 Angel's Flight is historical romance in the best classic tradition, with impeccable and accurate attention to detail, a cast of colorful characters, a villain of Basil Rathbonian magnitude, a swashbuckling hero, and a heroine who is...well a heroine. For readers who want to be transported to another time, this book delivers on its promise. I enjoy Juliet's writing, it's so rich and descriptive, ie. "rusty dignity" "Stars came out, a handful of silver cast into a lavender sky" "The crop stood smartly at attention, a rattling army of green and beige." Angel's Flight is the story of Angelica, a Dutch heiress, and Jack, the man who vows to bring her home to safety. Against the gritty, realistic backdrop of the Revolutionary War, their love grows even though she's a patriot and he's a British officer. The ending has a nice twist. A well written, entertaining historical romance that totally immerses you in the times. I enjoyed the storyline very much, living in the general area just outside the Hudson Valley, I grew up surrounded by the history of the Revolutionary War. It was interesting to read both points of view of the main characters, and reading about the history of the Hudson Valley, I grew up learning about the escapades of Ethan & Ira Allen and the Green Mountain Boys. Although fiction, this story seemed real and true to life as the main characters came to terms with their opposing views and happily one comes to agree with the other and a happy ending. This book was a nice read. I enjoyed it very much. The only complaint I have is the typing errors. Angel s Flight is a good historical story. Try it you will enjoy it. Angel's Flight is much more than a romance. A patriot during the Revolutionary War, Angelica TenBroeck narrowly escapes New York and the evil Tory clutches of Major Armistead. Her rescuer is also a Tory, and she has no idea how much to trust the handsome Jack Carter. Angelica and Jack risk their lives on their trip along the Hudson River to Angelica's family homeland. Along the way, a romance develops. The historical accuracy added great depth to the era and made me feel as if I was taking flight as well and sharing their journey. Highly recommended to historical fiction fans.